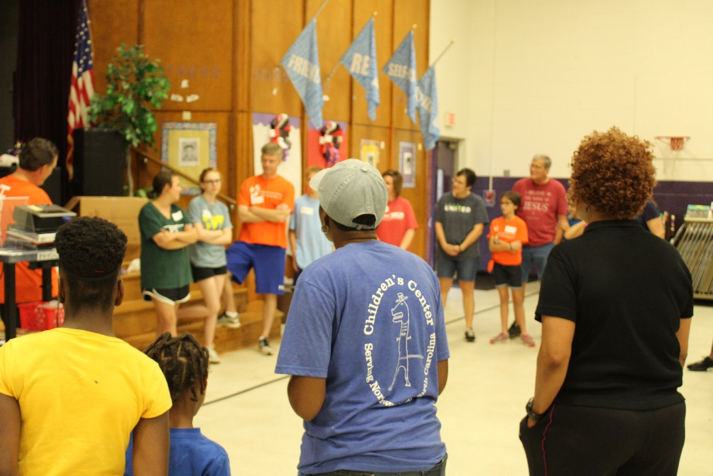 This past Saturday, July 28, 2018, we partnered with several ministries including Carolina Crown, New Canaan Society, Samaritan Feet, Second Harvest of NWNC, and others to distribute 1,250 pairs of shoes and 2,000 books to students of WSFC Schools. This was an opportunity to offer the community more than a pair of shoes, it was a chance to offer a little hope, and serve our community through washing feet and providing a message of the gospel and encouragement to families. Families came pouring into our three locations at Kimberly Park Elementary, Ibraham Elementary and Old Town Elementary. 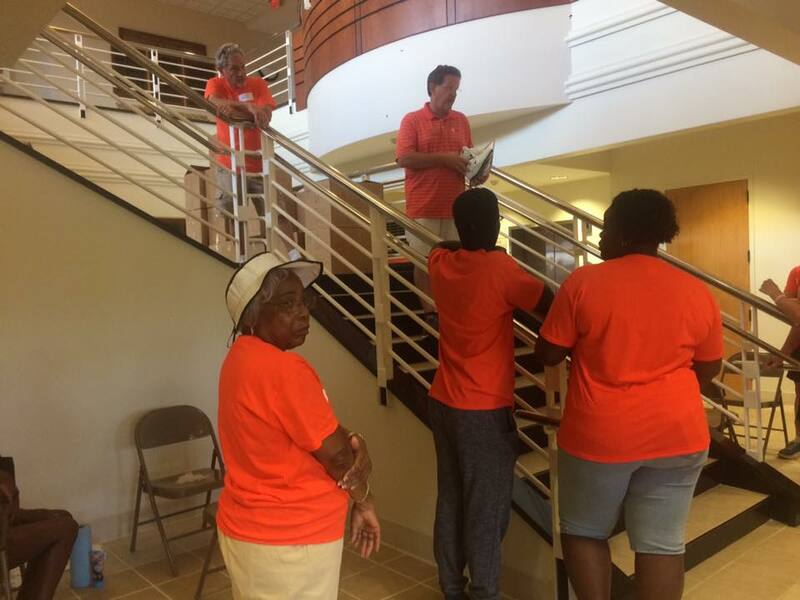 We had over 100 wonderful volunteers who came from churches, the communities and even as far as Fort Hood. We had roughly 400 pairs of shoes to give away at each site, along with food samples from The Food Bank, dance shoes, and books. Many of the kids were thrilled to receive their new shoes, one little girl started dancing in her new shoes, while another little boy started taking off his old shoes before he even got to a foot washing station. This was more than just a time to wash the kid's feet, it was a chance to encourage them, pray over them, and talk to them about school and the rest of life. This was a time for each volunteer to give a few minutes to show each child just how much they matter. This was a beautiful opportunity for the people of Winston-Salem to be the hands of Jesus and love our neighbors. "My favorite moment at Easton was when two young boys decided they'd do this (picture below) and laughed and smiled. For those of us who saw this, His great love was impressed on our day." "A momma who doesn't speak any English had brought four kids, all five and under. She heard about this and took a bus and walked 30 minutes. Her sandal had broken by the time she got to the school. She was sitting in the office speaking with a school admin, saying she couldn't make it home because her shoe was broken and she had a 1-, 2-, and 3-year-old with her. I went and got her a new pair of shoes and sock and gently put them on her feet. When I asked if she knew Jesus, her face lit up and I got to pray over their entire family. We met sooo many needs that day." 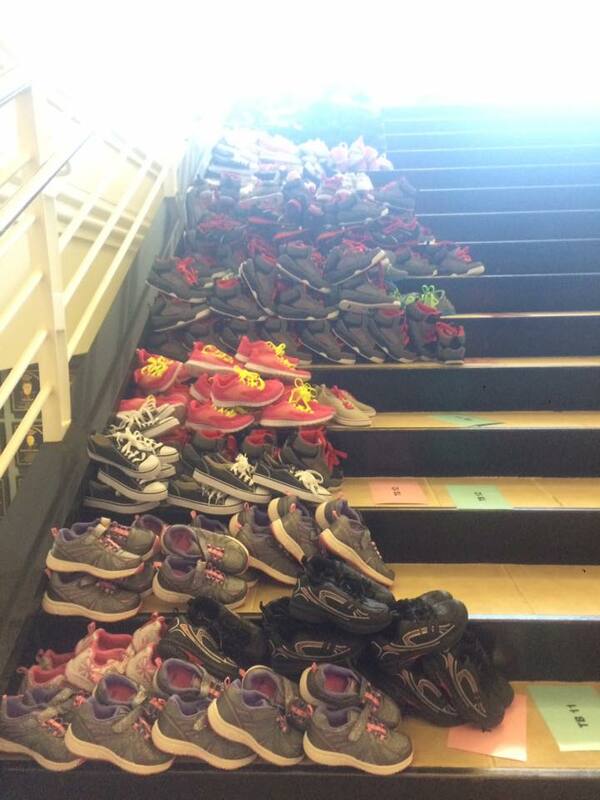 "My mother-in-law was blessed when she saw two boys with hygiene items with their new shoes on. The two boys were dancing around saying 'I got my own toothbrush!!'" See the story by Kim Underwood of WSFCS HERE. In 2017, we partnered with Crown Cares, Samaritans Feet, Coca Cola of the Carolina's, Walmart, & Molina Health Care to distribute 1,250 pairs of shoes and a message of hope to the Easton Elementary, Ashley Academy, and Kimberley Park Elementary Communities; Rolling Hills Community; and Piedmont Freedom School Scholars. Carolina Crown helped provide care for those in need before their performance at NightBEAT. To learn how you can help those in need, visit http://www.carolinacrown.org/index.php/crowncares View the complete 2017 DCI Tour schedule - http://www.dci.org/schedule Watch Prelims in Theaters with Big Loud and Live 14!